What's the Origin of "Nor'easter"? Bradley Craig is an HNN intern and a student at Harvard University. In a break from tradition (or perhaps it’s merely the start of a new one) the Weather Channel has given names to the major winter storms from the 2012-2013 season. Time will tell if this has been a particularly snowy winter, but as of the end of February sixteen of the twenty-three proposed storm names have already been used. None were more severe this year than Winter Storm Nemo, which socked the Northeast at the beginning of February, causing power outages throughout the Northeast and killing fourteen people. Nemo was far from the worst of the so-called “nor’easters” which regularly impact New England. Documented since at least the early nineteenth century, nor'easters regularly devastate the eastern coasts of Canada the United States. Nor'easters typically occur between the months of September and April (so there’s time still yet for another round – in 2007, a powerful nor’easter hit the East Coast in mid-April), and these storms usually cover an area of hundreds of miles or more. Heavy rain, snow, and winds tend to hit the New England region heaviest, causing flooding, property damage, and coastal erosion. The Oxford English Dictionary dates the appellation “nor'easter” back to the year 1837, although the less abbreviated form “north-easter” (also northeaster) goes all the way back to a Boston newspaper in 1753. The Great Blizzard of 1888 was one of the earliest severe weather events that gained notoriety in the Northeast when it hit New York City in mid-March, leaving an ice bridge across the East River. The Great Blizzard resulted in two hundred deaths in New York City and an additional two hundred throughout the Northeast. The aftermath of this particular event spurred the creation of New York's subway system and an overhaul of the city's infrastructure. 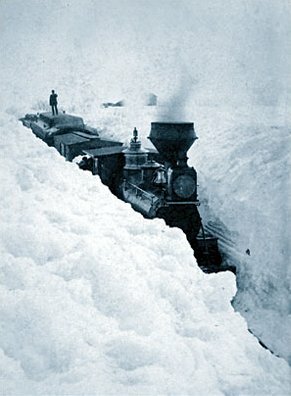 A locomotive nearly buried by the 1888 blizzard. 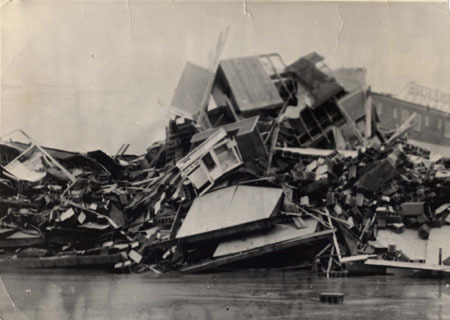 In 1950, the Great Appalachian Storm swept through almost 12 states throughout the Midwest and along the East Coast, leading to over three hundred casualties. The November storm required the Ohio National Guard to mobilize for rescue operations, although, in a stirring display of true priorities, the football game between the Ohio State University and the University of Michigan went ahead as scheduled. The most catastrophic nor'easter in the past half-century actually got its name from Ash Wednesday -- the Ash Wednesday Storm of 1962, which occurred between March 6 and March 8. The Ash Wednesday Storm's forty deaths and property damage to 45,000 coastal homes led to the establishment of new construction standards for beachfront homes. The damage totaled $90 million in Delaware alone. Wreckage in Ocean City, New Jersey from the 1962 storm. 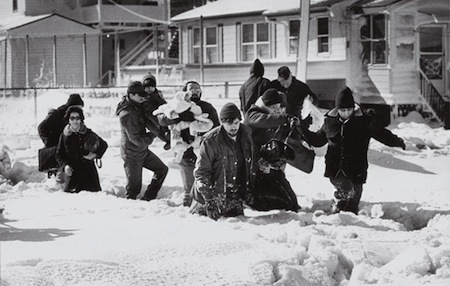 The Great Northeast Blizzard of 1978 wreaked tremendous havoc on lives and property as well. A record 27.1 inches of snow fell in Boston over the course of 32 hours and 40 minutes. Parts of Massachusetts and Rhode Island were named federal disaster areas during the storm. Over 3,000 vehicles were stranded on Route 128 in Massachusetts. In total, more than 4,500 people were injured during the storm and 100 died. The show must go on: musician Paul Benoit trudges through snow dumped by the 1978 blizzard to get to a gig. March 1993 witnessed a nor'easter that turned into the Storm of the Century, the convergence of three separate severe weather events. This storm shut down every major airport on the Eastern Seaboard for the first time in history. The event highlighted the need for a more efficient emergency notification system. As a result, the National Oceanic and Atmospheric Administration put in place new guidelines for threat communication. 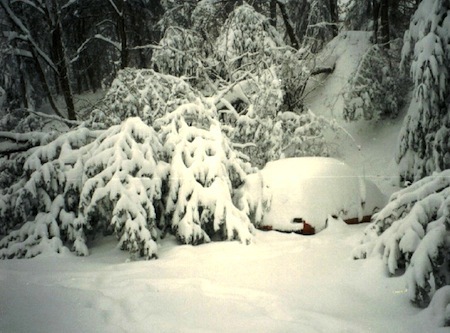 A car buried under snow and fallen trees from the 1993 Storm of the Century. Areas further south have not been immune -- extreme winter weather shut down the entire federal government for an unprecedented six days during the Blizzard of 1996, which hit Washington, D.C., Virginia, New Jersey, Rhode Island, Pennsylvania, and New York, among other states. Nine states were named federal disaster areas. Most deaths resulted from traffic accidents, but people also died of carbon monoxide poisoning while trapped in their cars. And, with Winter Storm Rocky bearing down on the Midwest this week and another month and a half of nor’easter season, we’re not out of the woods yet!